Offering incredible comfort, a wide variety of standard and available tech features, excellent safety ratings and a choice of 3 engines ranging from fast to ridiculous, the 2018 Audi A6 places itself as one of the best midsize luxury sedans in the world. Starting at $49,700, the 2018 A6 comes in 4 spectacularly sleek trims. They include Premium, Premium Plus, Sport and Prestige. New for the 2018 model year is a standard keyless entry/start and the MMI interface with navigation in the Premium trim, standard LED headlamps in the Premium Plus trim and standard 360-degree camera system in the Prestige trim. The 2018 Audi A6 features a turbocharged 252-horsepower 4-cylinder as its base engine - 11 more horses than what's found under the hood of the E300. The A6 also gets an EPA-estimated 25/34 city/highway MPG compared to the EPA-estimated 22/30 city/highway MPG the E300 achieves. In higher trims, the A6 features a supercharged V6 engine that delivers 340-horsepower is standard. Again topping the power of the Mercedes-Benz E300 sedan and E400 coupe. Inside the 5-seat 2018 Audi A6, drivers and passengers will sit comfortably in spacious and supportive seats, be surrounded by soft-touch materials and experience a cabin that feels downright palatial thanks to its standard sunroof - a pricey upgrade in the E300. Other standard tech features in the A6 include Android Auto tm, Apple CarPlay tm, Bluetooth®, satellite radio, navigation and an 8.3-inch touchscreen that controls the A6's MMI infotainment system. Available tech features include Bose® or Bang & Olufsen® audio systems, 4-zone climate control and more. The 2018 Audi A6 received a 5-star top safety score by the NHTSA. The vehicle features a standard rearview camera, front and rear parking sensors and more. Available safety features include night vision assistant, automatic emergency braking, forward collision warning, lane keep assist, blind spot monitoring and more. Visit Audi of Oklahoma City Today! 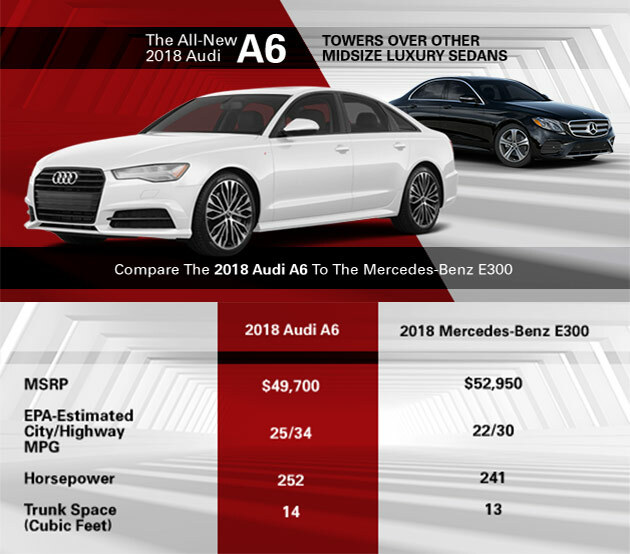 The 2018 Audi A6 is a well-rounded midsize luxury sedan that offers drivers everything they could want from a luxury vehicle. It is now available for purchase or lease. Fill out the form to schedule your appointment now!